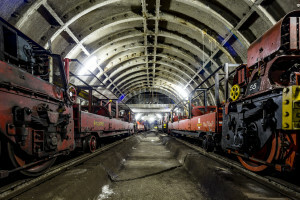 London’s newest tourist attraction – The Postal Museum – is due to open early next year in Clerkenwell, and will include Mail Rail – an attraction based on the miniature tunnels of the world’s first driverless electric railway. Mail Rail will allow the public into the tunnels of the Post Office’s private underground railway for the first time in its hundred-year history. Visitors will be able ride a looping mile of track to encounter the industrial heritage and secret geography of the capital. The line opened in 1927 and ran from the Paddington sorting office to the Whitchapel sorting office via Mount Pleasant. It was mothballed in 2003. Building work at the site in Phoenix Place, next to Mound Pleasant sorting office, will cost £26 million, raised through fundraising. It is expecting 186,000 visitors and 10,000 school visits in its first full year. Zone 1: The Royal Mail – will tell the story of the postal service’s earliest days. Zone 2: Mail for Everyone – follows the growth of the Post Office in the 19th Century. Zone 3: Post Office in Conflict – the story of the Post Office salvage squad, who braved the Blitz to save mail from bombed post offices and pillar boxes. Zone 4: Designs on Delivery – will focus on the mail’s historical connections with art and design. Zone 5: Communication and Change – will examine what the postal service meant to those it served.